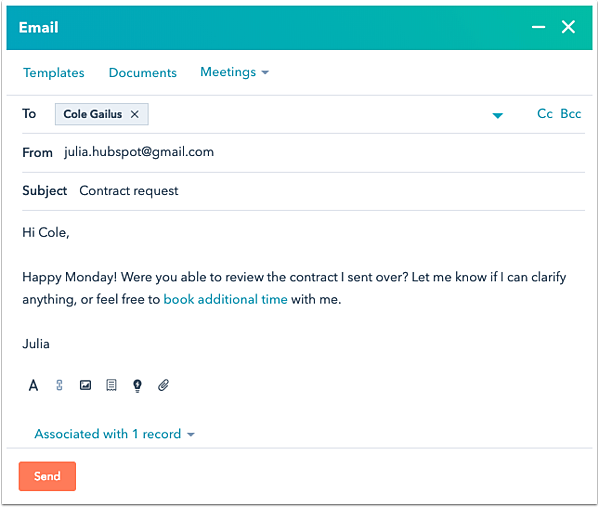 Learn how to connect a shared inbox to HubSpot, then send emails to your contacts directly from the conversations inbox. Please note: only users in your account with Admin access can connect a team email inbox channel. In the lower-left corner of your inbox, click Inbox Settings, then select Email. In the upper right, click Connect team email. If this is the first channel you are connecting, move through the setup wizard to create a team inbox channel for emails. Select which type of email account you want to connect. The conversations inbox can connect to a Gmail or Office 365 account. At this time, IMAP connection is not supported. If you are using an email alias or Google Group, you will need to set up a hosted email in the conversation inbox which you can use to forward emails from your email alias or Google Group. Please note: any inbox you connect for conversations should be a shared inbox because all incoming emails will be visible to your entire team. The email address you are connecting cannot already be connected in a user's email integrations. If it is, the user will need to remove the connection before you can integrate it into a conversations inbox. After you've made your selection, in the dialog box, click Continue. Review the terms about sharing this email account with HubSpot, then click Continue. Select which inbox you want to connect, enter your login credentials, and complete the connection process to allow HubSpot to access your inbox. Learn more about connecting your inbox to HubSpot. To control the from name your contacts see when you send them an email from your shared email address, click the From dropdown menu and select Agent and company name or Company name. Then enter the send from name in the text field. Click the Automatically assign to dropdown menu and decide how incoming emails should be routed to your team members. If you want to create a ticket for each new incoming email, click the Apply action dropdown menu and select Create a ticket. If you choose to create a ticket, use the right panel to customize the ticket properties. If you need to add more team members after you connect your inbox, or edit your routing rules or send from address, you can do so from your inbox settings. 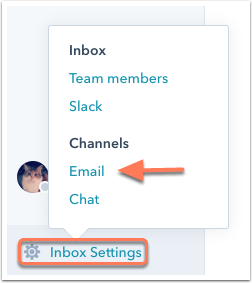 Any user in your account can use conversations, but they need to be included on a team inbox in order to email contacts. Compose an email in the inbox to start a conversation with your contacts. In the upper left, click Compose. Click the To dropdown menu and search a contact's name. Click the From dropdown menu to send from another connected, shared email address. In the Subject field, enter your subject line. Write your email. You can use an existing email template, or insert a document or meeting link into your email. The icons across the bottom of the email editor can be used to modify your text style, insert a link, add an image, include a snippet, link to a knowledge base article, or upload a file. The outgoing email will be logged to any record (contact, company, deals, or ticket) associated with the recipient's contact record. If you do not want the email to log to an associated record, click the Associated with dropdown menu, then clear the checkbox(es) for the specific record(s), or add new associated records. In addition to initiating an email conversation from the inbox, you can respond to an incoming email message. Just like with live chats, you have the contact profile in the right panel for context. In the left panel, click an email conversation to open it. In the reply editor, write your response. The icons across the bottom of the email editor can be used to modify your text style, insert a link, or upload a file. To use a document, snippet, meeting link, knowledge base article, quote, or video in your response, click Insert. When you're done with your message, click Send. If you need to CC or BCC additional recipients, add more recipients in the To field, edit the From email address, or manage the associated records, click the Edit email details icon enlarge to expand the email composition window. When the conversation is over, in the upper right, click success Mark as closed.